There is a lot that goes into preparing to say goodbye to a dearly departed. Between funeral arrangements and costs and writing the obituary, emotions can be at an all time high. But what if goodbye can mean a celebration? 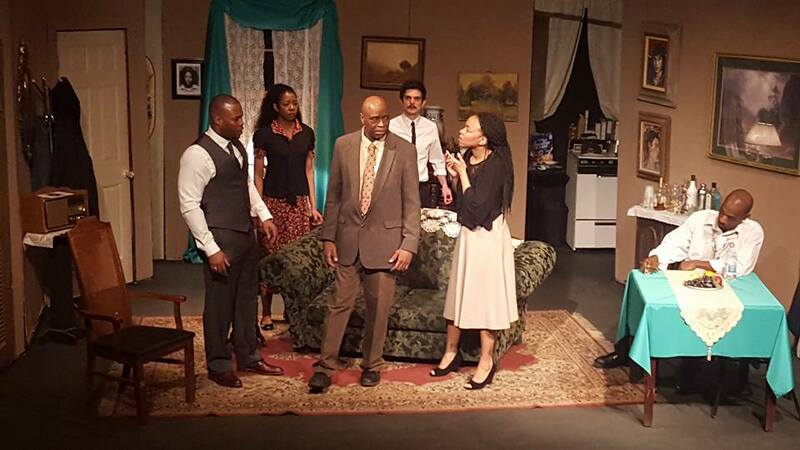 In Anne L. Thompson-Scretching's grim family drama Say Goodbye to Yesterday, the Cotton family buries the matriarch who happens to be leaving behind a large sum of money that could lead to life changes. But what happens when greed gets in the way? Staged at the American Theatre of Actors, Thompson-Scretching's drama follows the uniquely modern yet brazenly old-fashioned Cotton family who reunites to bury Venetta Cotton, a woman who long suffered from Alzheimer's. The siblings have a patchy history that gets revealed in a significantly unnatural manner but nevertheless, the tension is a driving force of the action. There is Ruby, who served as Venetta's default caretaker and hides behind a facade of false morality. Jake is a confrontational and defensive son who may or may not be stealing money from his mother and the family store. Grace arrives with Oscar worthy tears only to be the pendulum of allegiance. Matt is the adopted white son who has a past that tore the family apart due to jealousy and legacy. And then there is the estranged Paula who has virtually been disowned for lifestyle choices. The patriarch, Marcus, is an emotionally and physically abusive alcoholic who causes more strain and pain due to his lifelong string of poor choices and selfishness. With feuding personalities present, the only worry is who gets what in the will. But when a stranger arrives, all hell breaks lose. This is a play about a family broken up by circumstance. It's a dynamic story by Thompson-Scretching but the writing is sadly filled with cringe worthy lines leading to equally uncomfortable deliveries. As the truths are revealed, there are audible snickers simply because they are presented in such a farfetched manner. And it's unfortunate because the plot is brilliant. The execution needed great help. Additionally, the play is far too long. There is so much repetition that could be removed to help streamline and shorten the play. It would help the momentum not be as rocky as it currently is. The themes Thompson-Scretching introduces are strong and current. Rather than make this a generic living room play, there is a bite to the topics. And nothing is more topical than introducing a transgender character. Though it’s pretty predictable early on, we learn that Paula no longer identifies as a female but a man named Elliot. The way Thompson-Scretching approached the character along with reactions to him was done quite well. It was realistic but it’s a shame when the audience finds humor rather than heart. An outlying theme was the idea of being different. Between Matt and Elliot, it was one of the more absorbing ideas. It made their reward viable. The ensemble did as well as they could with the dialogue they were given. There was a strong familiar bond within the cast, though there were some interesting casting choices. Leading the cast was Elijah Trichon as Matt the adopted. His siblings may have taken advantage of Trichon’s Matt throughout but the adoration he shows is the glue of Say Goodbye to Yesterday. As Grace, Siobhan Crystal Alexander infused some jovial comedy into the mix. Alexander helped Grace’s moral compass waver as the plot furthered and of the three disinherited kids, you felt the worst for Grace. Kenneth Browning had an incredibly difficult task playing the alcoholic Marcus. Browning needed to discover the reality of the character but it strangely come off as a caricature. One of the more unfortunate performances came from the briefly seen Aaron the Lawyer. Stephen Staphnski seemed to milk his performance, pulling attention away from the story. Aaron wanted a backbone but his firmness went too far. It was abrasive. Say Goodbye to Yesterday had all the makings of an important play. It sadly missed the mark in execution. Perhaps in different hands, Say Goodbye to Yesterday will make its way to the masses.